With people increasingly taking on responsibility to fund their own retirement, the importance of getting financial advice has increased. Everyone, of all ages and all income brackets, needs to have a plan in place as soon as possible for their own retirement security. You should get the expert advice that you need to create a comprehensive plan to achieve financial security in your golden years. What are IRAs and do I need one? What should my retirement plan contain? How can a St. Louis retirement planning lawyer help me? What are IRAs and When Do You Need One? Individual retirement accounts (IRAs) can supplement a 401(K) or other employer-sponsored retirement account or can be used by people who do not have access to pension benefits or retirement plans at work. Money in these accounts is usually protected in the case of bankruptcy or creditor claims, so investing in an IRA means the money is kept safe for you until you need it for retirement. IRAs can provide important tax benefits to make it easier to save for retirement. There are income limits and annual contribution limits for IRAs, so opening up an account as early as possible is very important so you don’t miss out on any opportunities to contribute. Depending upon what type of IRA you decide to use, you may be able to invest with pre-tax dollars or may be able to allow your money to grow and be withdrawn tax free. Because there are different kinds of IRAs, including a SEP-IRA, Simple IRA, traditional IRA, and Roth IRA, you need to carefully consider which type of individual retirement account is the correct one for your specific situation. You also need to know the rules for making contributions and ensure that you are following guidelines while getting the most help you can in saving for retirement. What Should Your Retirement Plan Contain? At least one type of IRA is usually an essential part of your retirement plan. However, IRAs may not be the only thing you need to achieve a secure retirement. To make sure that you are using the right types of accounts and putting aside an appropriate amount of money, you should consult with a St. Louis retirement planning layer as soon as possible. Getting help early allows you to achieve the maximum benefits from compound interest, which will help your money to grow. You can also put aside smaller amounts each year over the course of your life, rather than having to make large investments if you reach middle age without a plan in place and without retirement savings. When you work with a St. Louis retirement planning lawyer, you can sit down with your attorney, provide details on your income and current assets, and discuss your goals including the age at which you wish to retire and your plans for retirement. Your attorney can help you to decide how much you want to save each month and in what types of tax-advantaged accounts you should put your money into. When you create IRAs or other kinds of retirement accounts, you also need to make informed choices about how to invest the money that you put into these accounts. Your lawyer can help you to evaluate different investment opportunities to ensure that you understand the risks. As you get older, the focus changes to making your money last and to knowing the required rules for withdrawing money for IRAs and other tax-advantaged retirement accounts. A retirement planning lawyer can explain rules for withdrawals, can help you to minimize tax consequences of taking money out of retirement accounts, and can assist with helping you to make your investments last for the course of your life. How can a St. Louis Retirement Planning Lawyer Help? 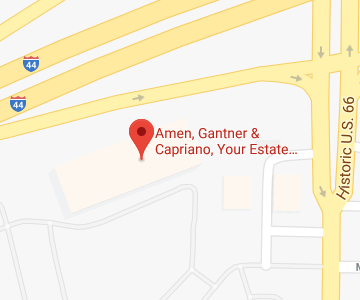 Amen, Gantner & Capriano- Your Estate Matters, L.L.C. will help you to set goals, take steps to achieve those goals, and take steps to protect your retirement assets. Give us a call at 314-966-8077 or contact us online to learn how our St. Louis retirement planning lawyers can work with you to achieve financial security for your retirement years.